Andrew Elisa was the son of an Anglican priest but was discouraged by the inconsistencies he saw between what the Bible taught and what the Anglican Church practiced. Did any church body faithfully follow what Scriptures taught? LHF answered Andrew’s call by sending him five copies of Luther’s Small Catechism and Book of Concord. Excited by what he read, Andrew shared the books with his Christian friends and the rest, as they say, is history. The Holy Spirit worked powerfully through God’s Word, taught simply and faithfully in the catechism. 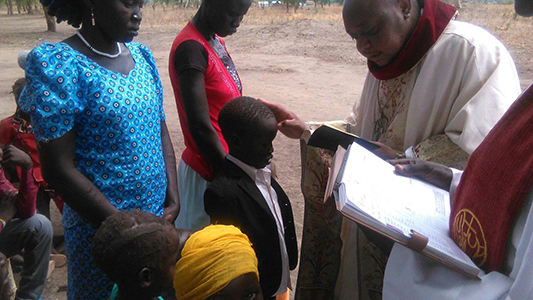 With encouragement from LHF leadership, Andrew Elisa became a pastor and formed the Evangelical Lutheran Church in Sudan. But tragedy struck in late 2008, when Rev. Andrew Elisa, now bishop of the ELCS, died of a brain tumor. Though his death threw the young church body into disarray, God was still watching over and taking care of His children in Sudan. What nobody knew then was that a young man Rev. Elisa had encouraged in the faith – Peter Anibati Abia – would soon go to the seminary to become a pastor himself. Eight years after Rev. Elisa’s death, Rev. 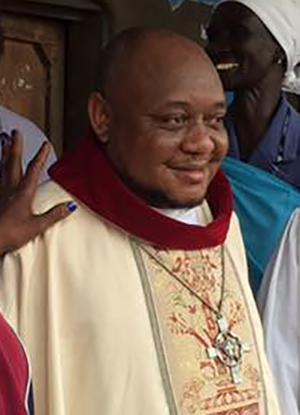 Abia was installed as the new bishop of the ELCSS/S. Through the funding received from the LHF, the ELCSS/S has been able to provide stipends for her workers and operate a theological seminary known as Concordia Lutheran Institute for Holy Ministry (CLIHM) for training pastors and deaconesses who reach out to many in South Sudan/Sudan with the Gospel of our Lord and Savior Jesus Christ. “Honestly, we in the ELCSS/S are amazed by what the Lord is doing in our midst. Even in the face of suffering, the church is growing. Many are coming to faith, especially in the refugee camp, and as a result, the membership of the ELCSS/S currently is nearly 150,000. Without the presence of LHF in Sudan, none of the things mentioned above could have happened. “God’s Word continues to amaze us. It is effective and surely does not return back empty! We should make use of every opportunity we get to reach out to the lost with the Gospel which is the power of God unto salvation.